The election is over, but the Joe the Plumber case is not. The Beacon Journal has learned that, in addition to the Department of Job and Family Services, two other state offices — the Ohio Department of Taxation and Ohio Attorney General Nancy Rogers — conducted database searches of Joe the Plumber. 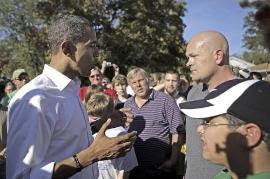 Wurzelbacher became an instant celebrity after he asked Barack Obama a series of questions in his Toledo driveway about the Democrat's tax policies. In the third debate between Obama and Republican John McCain on Oct. 15, the candidates referred to Joe the Plumber more than 20 times. The next day, the taxation department conducted two separate searches of a database of liens for unpaid taxes that were certified to the Ohio Attorney General's Office for collection. John Kohlstrand, a taxation department spokesman, said he is prohibited from talking about individual taxpayers, but he confirmed that the databases were checked. The searches were done to determine whether a lien placed against the individual was appropriate and whether it remained unpaid or not, Kohlstrand said. The department's first search of the day was unsuccessful because of incorrect information about the individual, Kohlstrand said. Ohio Attorney General Nancy Rogers' office then contacted taxation because it was having difficulty accessing the database, Kohlstrand said. After the two agencies talked, taxation completed a successful search. Kohlstrand said that the AG's office wanted access to the records so they could turn over to the national media lien information that was a public record in Lucas County. He said the national media did not have reporters in Toledo, so the attorney general's office was helping them out with public records. On the day following the two searches, the taxation department conducted a search of another in-house database that tracks cases and correspondence between taxpayers and the department before the liens being certified and turned over to the attorney general for collection. Rick Anthony, deputy tax commissioner, said there are times when a payment can be in the pipeline so a lien appears unpaid when in fact the taxpayer or business has repaid the state. Anthony said the database searches on both days were conducted to ensure that the information in Lucas County was being properly reported by the media. ''We are not aware of any inappropriate browsing of information by anyone in our department pertaining to Mr. Wurzelbacher,'' Kohlstrand said. Jim Gravelle, a spokesman for Attorney General Rogers, said he could not comment on individual records because of privacy issues. He said he would not confirm or deny that the AG's office went to taxation or whether his office had been queried by the inspector general. The day after the debate, media outlets began reporting that Joe the Plumber's real name was Samuel, he was not a licensed plumber and he owed close to $1,200 in back taxes and additional money to a hospital. His home was besieged by media outlets, including television crews that camped on his lawn. Wurzelbacher had questioned Obama's plan to raise taxes for anyone with an income exceeding $250,000 because he planned to purchase his own plumbing business. His current income made him eligible for a tax break under Obama's plan. Wurzelbacher later endorsed McCain at a campaign stop in Ohio and hired the Pathfinder Management group in Nashville to manage his career. Kohlstrand would not comment on an investigation by the inspector general, but Charles confirmed Thursday that he is looking into the taxation department to determine whether their searches were appropriate. Charles said he does not know at this point if anyone in any of the agencies did anything wrong. The inspector general began investigating after news reports surfaced that Helen Jones-Kelley, director of the Ohio Department of Job and Family Services, ordered her agency to conduct background checks on Joe the Plumber. Jones-Kelley maintains that her agency routinely checks on people who are thrust into the spotlight to determine whether they have unpaid child support bills, are receiving public support from her department or owe unemployment taxes. After the election, Gov. Ted Strickland placed Jones-Kelley on paid leave. The governor said the suspension was for a matter unrelated to the background checks on Joe the Plumber. Dennis J. Willard can be reached at 614-224-1613 or dwillard@thebeaconjournal.com.